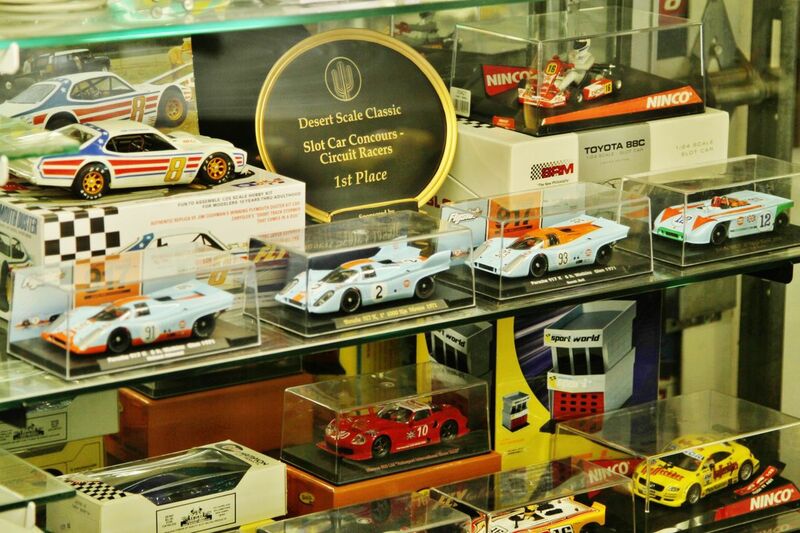 PHOTO COURTESY OF SLOT MODS USA Slot car tracks were a hobby for David Beattie — and then he lost his job during the last recession. 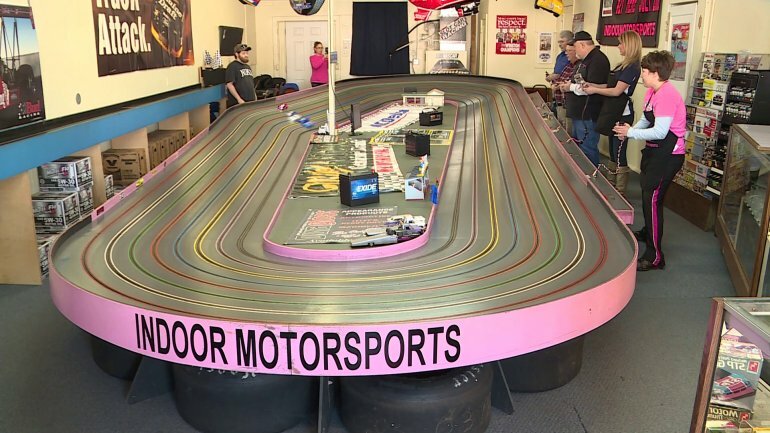 Lo and behold, the 170-foot race course in his basement inspired a new career track: Slot Mods USA. 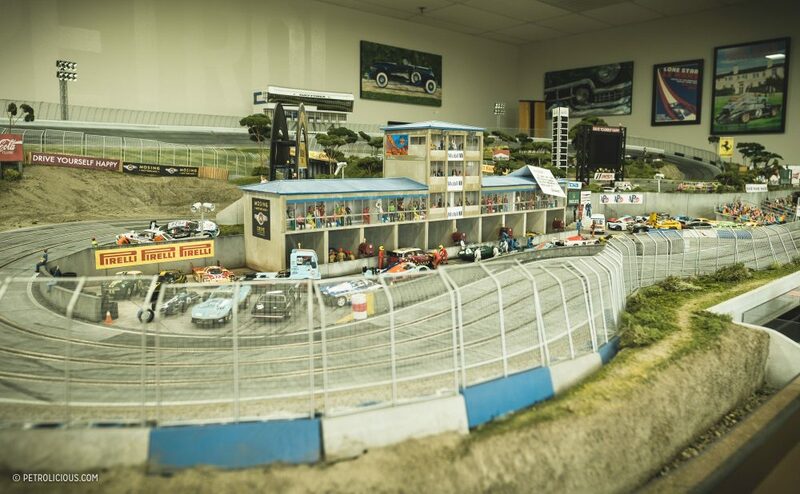 After losing his office job five years ago, David Beattie made a life-changing decision to pursue his passion for the racetrack — specifically, the miniature racetrack. He found his true calling: slot car racing. 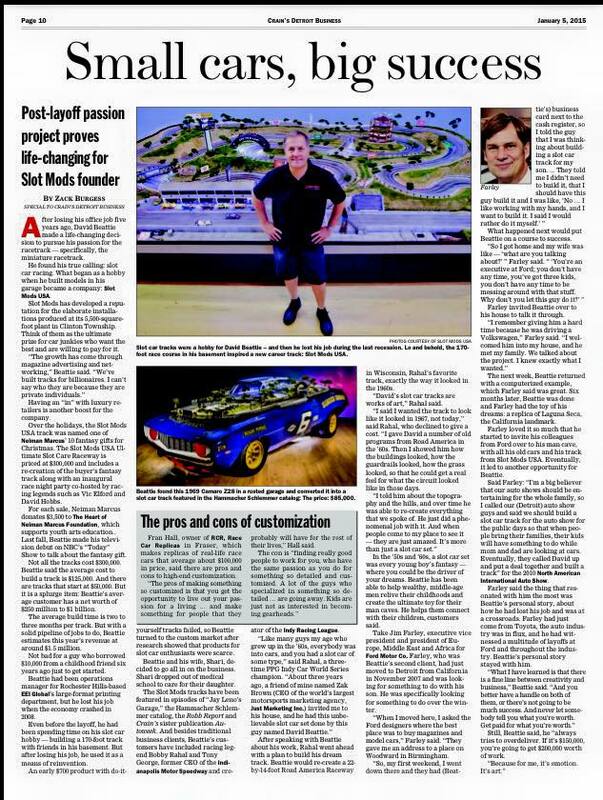 What began as a hobby when he built models in his garage became a company: Slot Mods USA. 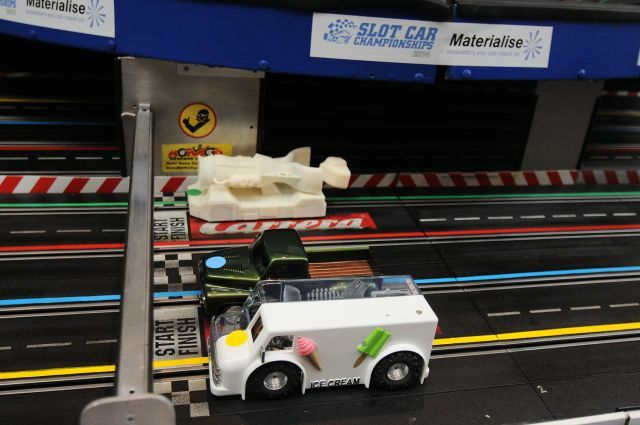 Slot Mods has developed a reputation for the elaborate installations produced at its 5,500-square-foot plant in Clinton Township. Think of them as the ultimate prize for car junkies who want the best and are willing to pay for it. Having an “in” with luxury retailers is another boost for the company. Over the holidays, the Slot Mods USA track was named one of Neiman Marcus‘ 10 fantasy gifts for Christmas. The Slot Mods USA Ultimate Slot Care Raceway is priced at $300,000 and includes a re-creation of the buyer’s fantasy track along with an inaugural race night party co-hosted by racing legends such as Vic Elford and David Hobbs. For each sale, Neiman Marcus donates $3,500 to The Heart of Neiman Marcus Foundation, which supports youth arts education.. Last fall, Beattie made his television debut on NBC’s “Today” Show to talk about the fantasy gift. Not all the tracks cost $300,000. Beattie said the average cost to build a track is $125,000. And there are tracks that start at $50,000. But it is a splurge item: Beattie’s average customer has a net worth of $250 million to $1 billion. The average build time is two to three months per track. But with a solid pipeline of jobs to do, Beattie estimates this year’s revenue at around $1.5 million. Not bad for a guy who borrowed $10,000 from a childhood friend six years ago just to get started. Beattie had been operations manager for Rochester Hills-based EEI Global‘s large-format printing department, but he lost his job when the economy crashed in 2008. 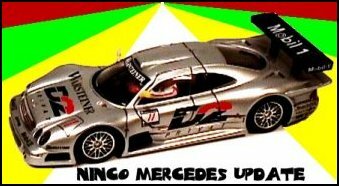 Even before the layoff, he had been spending time on his slot car hobby — building a 170-foot track with friends in his basement. But after losing his job, he used it as a means of reinvention. 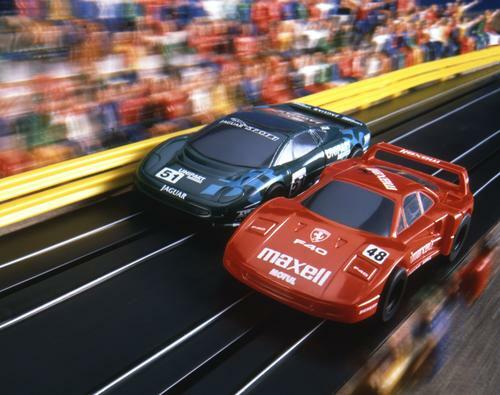 An early $700 product with do-it-yourself tracks failed, so Beattie turned to the custom market after research showed that products for slot car enthusiasts were scarce. Beattie and his wife, Shari, decided to go all in on the business. Shari dropped out of medical school to care for their daughter. The Slot Mods tracks have been featured in episodes of “Jay Leno’s Garage,” the Hammacher Schlemmer catalog, the Robb Report and Crain’s sister publication Autoweek. And besides traditional business clients, Beattie’s customers have included racing legend Bobby Rahal and Tony George, former CEO of theIndianapolis Motor Speedway and creator of the Indy Racing League.